Look Black n Amber: Cup competitions: should they really be a priority? Cup competitions: should they really be a priority? Our unsurprisingly bad start to the campaign continued last week with two league defeats (at home to Northampton, 2–1 and away to Shrewsbury 3–2) on either Saturday with a victory on the Tuesday night – 3–1 in the Johnstone’s Paint Trophy at the hands of Gillingham, at Priestfields. This was our second win in the competition, following a further 3–1 victory in the first round against Colchester United at the Weston Homes Community Stadium. The draw which took place on Saturday morning before the game at the Greenhous Meadow saw us pitted against Cheltenham, which will be in the Southern area quarter final (for those who are remotely interested, games will be played on the 8th/9th November) – a mere three games away from a trip to Wembley for the final. It’ll also be our fifth away tie (out of five games) in all Cup competitions this season so far! I think it’s fair to say we seem to be performing a lot better in the cup competitions this season, in comparison with recent years; however, for me, this is massively frustrating, as despite decent runs, we are clearly underachieving in the League. The table doesn’t lie and I would much rather be getting the points on board (now, and throughout the season), than be having these cup runs. Even more so when you take into account one is nicknamed the “paint pot”, and the other, the “Mickey Mouse” trophy – both inferior in terms of prize money and overall club revenue, and the former inferior in terms of the quality and stature of the teams that participate. 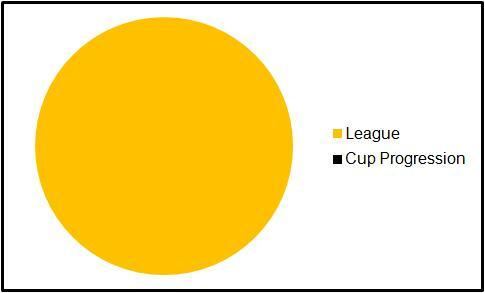 Talking of the League Cup, a further example of where we fared well (up until the second round, that is). Round one saw us paired up with a massively difficult away tie at Fratton Park and Portsmouth – where we triumphed to a victory, albeit a 1–0. The second round wasn’t much kinder to us, again another trip on the road, this time at Burnley. Despite unfortunately losing in extra time (with the scores levelled at 2–2 after 90 minutes), we gave a very good account of ourselves – it’s just a shame we cannot put those kind of performances in on the average League game, where ultimately it matters. With the FA Cup still in its preliminary qualifying stages and us not scheduled to play until the first round proper (November 12th is the date for that), the following month is surely high time to get some wins together and more importantly, gain some points. We haven’t got the concern of any Cup competitions up until the second week of November – but it looks set to be a busy month with the League and two Cups to worry about. Now, let’s be honest, if you’re a supporter of a League 2 club like myself, you’re only ever interested in a cup run if it culminates in your team getting a glamour tie at the stomping grounds of the likes of Manchester United, Chelsea, Arsenal, Liverpool, Tottenham etc. This is where the League Cup was harsh on us (with no disrespect to Burnley, of course) – in our case, it’s all about getting a tie we as fans, and the players could only ever dream of. After looking at the prize fund in the said, JPT, I can’t help but feel slightly disappointed and that surely our priorities should be focused elsewhere, i.e. the League. Obviously this is scraping the bottom of the barrel for the worst case scenario, but imagine if we (or any other club, for that matter) got that trip to Wembley and won the £40,000 jackpot at the end, but then got relegated. Think of all the money lost as a consequence. Like I said, worst case scenario, and it doesn’t really bear thinking about. For beating Colchester in the first round of the cup, we received a measly £5,000 – probably covering the wages of Izale McLeod and Mark Marshall for a week! The victory against Gillingham last week saw us pocket £7,000, again not much better! A win in round three against Cheltenham will see a prize of £10,000; area semi final winners receive £17,000 and area finalists, a more modest £25.5k. I was unable to find the prize pot for each round of the Carling Cup, but I can’t see a knock-out after round two really generating that much cash. The FA Cup has yet to release its prize money for this season, but again, that will also depend on how far we progress. In the long run, is it really worth it? To see if it was just me who felt this way, I decided upon putting a poll on the blog for a couple of days. The question posed was: ‘As a fan, which do you feel is more important?’ – with the answers ‘League’ and ‘Cup progression’. The results are as follows. The modern day footballer: a role model?